Today such a reaction is counter-cultural. I am amazed by how quickly and completely these men and others answered the call to an obedient and sacrificial “Yes!” Were they fully committed? Definitely! We find an honourable young man and woman in the process of planning and preparing for their wedding. Full of love for each, they anticipate and dream about many wonderful years ahead. Then the unexpected! Mary is pregnant! Joseph wanted to do what was the very best according to the law with the greatest compassion toward Mary. In this midst of the agony of “obvious” betrayal, an angel appears to him in a dream confirming what Mary had tried to explain already. Joseph believes the unbelievable, the child is conceived of the Holy Spirit! Joseph didn’t wrestle for days or even hours to weigh the implications. Neither did he allow emotion or sound reasoning to dissuade him. He responded immediately! Joseph’s, “Yes, Lord!” would cost him his reputation and alienation from friends and family. When Joseph and Mary traveled to Bethlehem, Joseph’s home town, to register for taxes no one received them. Aunts and uncles, cousins, and perhaps siblings lived here. No room! There was no room for this family! Another dream, another angel, another message, another “Yes, Lord!” For the sake of his wife and family he would become a refugee without securities of homeland. In fact, we see Joseph so loved and obeyed God that there would be a pattern of laying himself down in order to do the will of God. Don’t skim through the lines thinking these were easy choices. Joseph’s sacrificial “Yes!” came at a great price! God chose well who to establish as the step-father for His Son. He could trust Joseph to obey! casting a net into the lake, for they were fishermen. They didn’t immediately leave the family business, assets and industry because Jesus was a world renowned leader with a huge following and giant reputation. This was the beginning of Jesus’ ministry. Peter and Andrew were the first to follow! There were no contracts explaining personal benefits! No explanation of the ministry or mission plan! No introduction to a pension plan or benefit package! “I will send you out to fish for people,” sounds quite vague to my always questioning mind. Such immediate response is beyond understanding. They were laying everything down for the sake of Christ. Everything! Can you feel the heart of Zebedee in this encounter? Later, he would perhaps understand, but right now was difficult. He wasn’t as young as he once was. He depended on his boys to carry on the family business and help him in his retirement. Life ahead would be radically different from everything they knew. Others would join them in similar fashion. sitting in the tax collector’s booth. Some of John’s disciples would shift ranks and follow this Jesus. First they weighed the odds, asked many questions and tested Jesus’ ministry. Other’s like Nathaneal would initial scoff. Some would refuse the call altogether choosing rather to stay in their place of normal. Family, security and reputation are hard to risk! God probably isn’t asking such a great price from you. But then, maybe He is! Just this past week I met another young couple leaving all with a resolute, “Yes, Lord!” as they venture to another unreached people group. Neither they nor their destination can be disclosed for their own protection. We send our best; it is the best whom Jesus calls. I wish I could testify that I too have consistently and quickly said “Yes, Lord!” Unfortunately, it has not been so! I am challenged in my level of willingness to yield wholly and immediately to His voice. The voice of Jesus calling more followers may come through the bible as one reads and studies. Perhaps, it will come through a dream or vision. It may come through an open opportunity under the leading of the Holy Spirit. May my response be as immediate and complete as other followers of the Messiah. On the backs of their obedience we can trace the expansion of Christianity worldwide. They knew nothing of the impact they would have. Nothing! Yet, they put in action to their, “Yes, Lord!” and followed him – not perfectly, but completely. It is never too early or too late to do the same. Join the chorus of others. 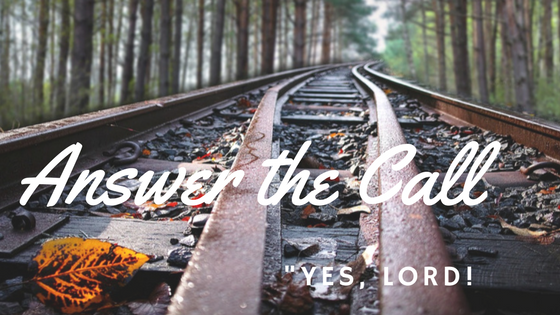 Say, “Yes, Lord” when you sense He is calling you to motion! Procrastination – Putting Off for Tomorrow What Should be Done Today! If you haven’t already signed up, here’s the link to receive blogs automatically!